On the picture above you can see the hot stamp emblem used on the 84mm knives during 1976-1986, it is the same after 1986 too. The emblem used does not have many variations and i do believe this size found its way on the 91mm economy made knives from time to time. What is interesting is that the knife on the left got the backside economy stamp used 1976-1980 and i would believe it to be from the late 70s. The next knife i have with an original box and this got the officier Suisse backside new stamp after 1980. I do believe this knife to be from 1980-1985 and probably early 80s. Not completely sure. This knife got the combination tool that arrived in 1982 on the 84mm knives. I do believe this combination tool was used before 1982 and i would say 1980 based on knives in the economy line. I believe it was more early on this line yes. Have yet not found the 84mm hot stamp shown completely the same on the 91mm, but i am sure it should or could be out there. back to the 84mm emblem and yes there are variations just not so many as on the 91mm in these periods. The next knife i am going to show you is interesting. I do believe it to be in the correct card display box, if not let me know. Anyhow i believe this knife to be on the border towards the changes on the 84mm knives. The emblem got a more slim cross that i have seen on more early knives and from time to time during the 80s. 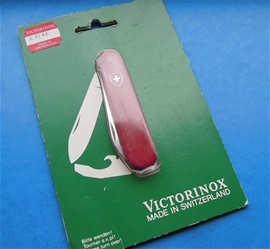 The knife got the combination tool and small v in victorinox on the tang but not on the card display box. It is difficult for sure and i would need further information and knives to be sure about the v changes. Cool! I wonder if i am correct that this knife and card display box is from the mid-1980s-1987s? It looks so! The color on the emblems on this page got silver color, this is usually so on the hot stamp emblem with this type. On the picture on the right are emblems used on the 84mm knives 1980-1986. There are obvious differences with both production variations and on purpose. The Hot stamp emblem is not always into the economy knives category. The Hot stamped emblem cross and shield that we know used on the economy made knives from 1994 was used before on other categories. You can see knives from 1980s with this type of cross and shield embossed hot stamped type emblem. Lately I have been trying to find some more information on the pocket pal 84mm configuration with two blades. One large and one small blade on it. Without a doubt you will find the name pocket pal used on alox, open riveted and hidden rivet cellidor knives. My interest is on the hidden riveted 84mm Pocket Pal Cellidor handled ones. The problem is finding knives to compare so I have to rely on what I have seen over the years. This knife you will find with and without the key ring as well. 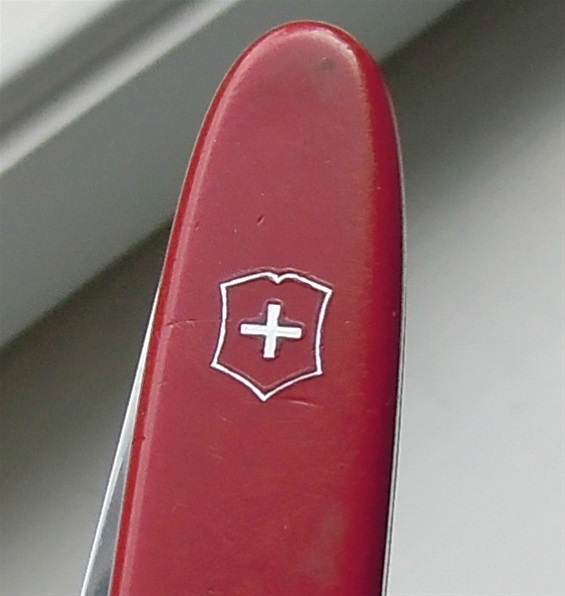 From before we know about the Large V in Victorinox on the stamping on the tang and the shim on different knives changed from brass to nickel silver not far from each other in the second half of 1980s. That said there are not always a common change that happened together on the different categories and knives. Some are earlier and some are later, this is important. I have noticed that some Pocket Pal knives from the 1980s got some warping on the ends on the handles. This is sometimes because of abuse but also some came so from the factory. I can say that the Pocket pal is a bit special with the evolution and one cannot date this knife from the tang stamp, shim and emblem only. In the evolution and history you can find it with inlay emblem, hot stamp and pad printed or colored in different emblem configurations. It is my feel that most knives that got the hot stamp type emblems are more close to economy or the economy category. One cannot always call it economy made anyway. What I can say to help date more early hot stamped Pocket Pal knives are how detailed the emblem is. On this you can see that because the lines forming the emblem are so narrow that it is not a very precise one on such a close image. On the normal distance it is detailed enough. I would believe it is more difficult to make this because of the narrow lines and that it is very shallow. I must always take into consideration that the handles have been changed from other knives and that this would complicate everything. It does look original and this knife caused me to reconsider many times the age of it. It cannot be one day junger than 1994 and to me it feel much closer to the late 1980s. One very important detail on the Pocket Pal is also the thickness of the handles. This I would believe is the key to some of my questions. I always look on the functions, springs, liners and all possible details to date them as well. If you look on later made Pocket Pal knives you see more bulky handles. “The hot stamp emblem used on the pictured Pocket Pal Configuration above you can find on earlier models during the 1980s decade and later. There are more dates too! The slim 84mm knives are interesting for different reasons. They are called” Gentleman’s” knives, dress knives or also actually selected for crafts work and hobbies. This is because the small slim fine knife blades can fit into spaces and areas that require fine cutting tools. The Pocket Pal has seen use with watchmakers and watch users. This is because the slim edge or blades can be used to open the backside lid on wrist watches or pocket watches the same. There are special purpose functions made by the Ibach Company for such tasks. The fact is that many retailers and watch repair stores actually use the fine knife blades instead. This usually wears the edge over time and requires regular sharpening or also in some cases the edge is a bit dull but still slim enough to fit the gap for opening a watch. Without a doubt the hot stamp emblem you find on such knives is not necessarily an economy line knife. 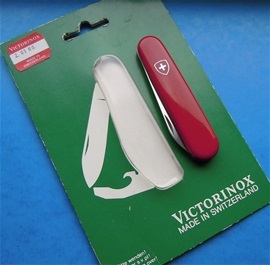 The inlay used on the Victorinox Cellidor knives is the best and it gives the best quality impression. That said the hot stamped handles are the most interesting of any Victorinox made knives in my opinion. To distinguish an economy made knife is rather easy if you study Sakhome.com. The tang stamps and emblem can readily your estimation of category and date quickly. The handle material and shade, functions and thickness of the blades can give additional information. 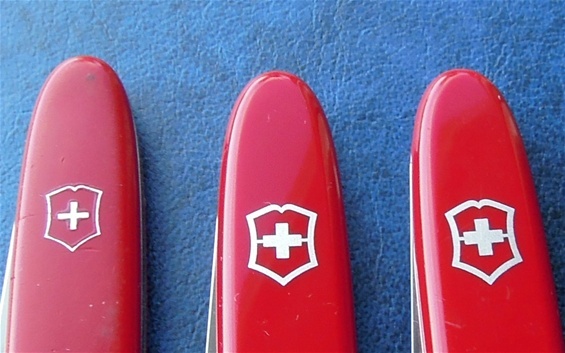 Every Victorinox knife is a blueprint of history and the development of the production. It gives a time window if you study them further. There are other differences with anodizing and finish that will give even further details for the window. Remember that this line of knives does not follow the regular evolution that is most related to the development of the 91mm Officiers knives. The 84mm is even more difficult and there are clear diversions between a regular 84mm line and the economy 84mm knives as well. I do not believe the 84mm Pocket Pal discussed above is an economy knife. There are more to it. There are steel grade differences between the regular and economy made knives too. Ok on the picture above are 3 Pocket Pal configurations with the emblems. The left one is the already shown hot stamped one. Next are two pad printed emblems with two major differences and one that people should remember. This is into what I have discussed on Sakhome.com about the design changes, production variation and evolution. The two are not necessarily in correct date order compared to the hot stamped type. Some differences like this are also done on purpose I believe to protect the product against copies. If you look on the emblem cross and shield with depicted lines you can see the big difference in design. I have noticed at least 3 differences on the pad printed silver emblem with depicted lines from the cross as well. Two of them are on the picture above already shown today. If you take a magnifier glass on your own knives you can see that the color pattern is a bit different over the years. That means there are different production technics done to make the emblem. This can be used in dating knives. Also take into consideration that use wear by use will change the appearance of the emblem color pattern. I like to call the emblem pad printed but there may be different technics anyway. 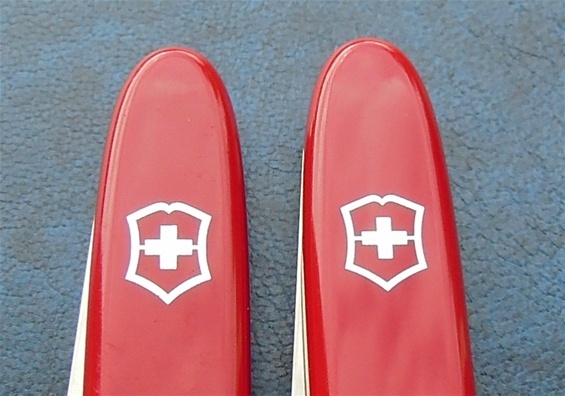 Remember that the tang stamp and the emblem are very important with the Victorinox products. Another thing that I have my eye on is a small difference in the tang stamp. There are very many different types and one is the big V and the small v. What I have my eye on is a Big V with one side of the V wider. There are like I mentioned many variations and changes done on the Pocket Pal in history. The introduction of more bulky handle scales is because of different factors. 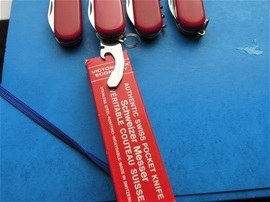 The 84mm slim line of pocket knives made by Victorinox got a constant quality development and the small changes are used actively. Catalogues are a great help with knives and to learn more. That said it is not possible to use this as any guarantee for small changes like I am talking about. The Victorinox tang stamp and emblem are used actively with the development of products and to protect them against piracy. Back to the bulkier handle scales for example it can be because of production changes and also for the comfortable use. It can be because of the new construction and molding of the handle scales as well. The reason why one cannot use the catalogues to distinguish and date the changes of the emblem like on the picture is simply because the same knife pictured in a more new catalogue may actually use the previously used picture of the Pocket Pal configuration.